• 1902 ~ Solomon Cutner, Classical pianist. A virtuoso performer, he played Tchaikovsky’s First Concerto at the age of 10. His career was stopped after a stroke in 1965. • 1910 ~ A.J. Fisher of Chicago, IL received a patent for an invention that moms, grandmas and single guys certainly came to appreciate: the electric washing machine. Previous to Mr. Fisher’s invention, washing machines were cranked by hand (not easily done) – or you used a washboard (also sometimes used as a musical instrument). • 1919 ~ Ruggiero Leoncavallo, Italian composer and librettist, died. He is famous for the single opera “Pagliacci” but never repeated the success with his other works. • 1932 ~ Helen Morgan joined the Victor Young orchestra to record Bill, a popular tune from Broadway’s Showboat. • 1963 ~ The TV program Ready, Set, Go! premiered on the BBC in London, England. The show gave exposure to such music luminaries as Bob Dylan and The Rolling Stones. • 1964 ~ Joan Baez and Bob Dylan shared the stage for the first time when the singers performed in a concert in Forest Hills, NY. • 1969 ~ Hot Fun in The Summertime, by Sly and the Family Stone, and Easy to Be Hard, from the Broadway production Hair, were released on this day. Hot Fun made it to number two on the music charts and Easy to Be Hard climbed to number four. • 1975 ~ Dmitri Shostakovitch, Russian composer, died. He wrote 15 symphonies as well as operas, ballets and film and theater scores. • 2003 ~ Chester Ludgin, a baritone in the New York City Opera for more than 30 years, died at the age of 78. He also portrayed the part of Sam for Leonard Bernstein’s “A Quiet Place” at the Houston Grand Opera in 1983. He also sang for the San Francisco Opera and other North American companies. 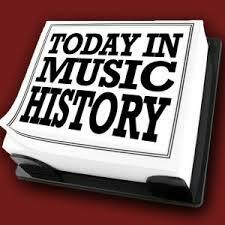 • 2005 ~ News Item: New Vivaldi work heard for first time in 250 years. This entry was posted in Composers, musicians, Pianists, Today in Music History and tagged composer, conductor, Dmitri Shostakovitch, Leonard Bernstein, librettist, music critic, Peter Ilyich Tchaikovsky, pianist, Today in Music History, video, violinist. Bookmark the permalink.